The Epson Artisan 810 is a multifunction inkjet photo printer designed predominantly for consumer use and to produce high-resolution photographs at resolutions well beyond those offered by even current color laser printers. For the home user or for occasional high definition graphic use in an office environment, it includes a number of features almost never included on office equipment to make working with it from other consumer items increasingly convenient. The Artisan 810 measures 18.3" by 25.8" by 7.8" and weighs 23.1 lbs. It will fit conveniently on a desk alongside other equipment and should be easily movable by one person given its lightweight construction. With its trays shut, the printer measures 18.3" by 18" by 7.8", even more compact, but the printer cannot be used in this capacity. The 810 prints at 9.5 pages per minute in black and 9.1 pages per minute in color. Its copier function is much faster, offering copies at maximum speeds of 38 copies per minute in both black and white and in color. The 810 has a maximum printing resolution of 5760 by 1440 dpi, almost six times that offered by most contemporary laser printers. The 810 is designed to communicate with a number of devices. Its front USB port allows it to interface with and charge devices like MP3 players, cell phones, and digital cameras, and it goes above and beyond standard networking support by including both wired and wireless network connections and support for printing directly from an iPhone, iPod Touch, or iPad. The 810 also has photo manipulation software built directly into its firmware, accessible without a PC, for easy corrections and printing. It can also function as a standalone copier, able to print to letter-sized paper and produce up to 99 copies from the embedded firmware. Images can be viewed on the 810's built-in 3.5" LCD and manipulated using the self-illuminating 7.8" touch panel. The 810 supports 802.11b, g, and n, as well as 10/100 Ethernet, USB 2.0, and optionally Bluetooth. It also includes ports for SD memory cards, xD-Picture Cards, Sony Memory Stick, Compact Flash, and MultiMedia Cards to eliminate the need for tedious, cumbersome adapters and to make connecting the camera's memory to a computer before printing. The 810 can hold either 120 sheets of plain paper or 10 envelopes in its paper tray. Its photo tray can store 20 sheets of photo paper. The printer can print to almost any paper size or type from 3.5" by 5" to 8.5" by 11", as well as printable CDs/DVDs, photo paper from 4" by 6" to 16:9, and No. 10, Plain, Bond, and air mail envelopes. Unlike many low-end printers, du plex printing is automatic, and the printer includes built-in automatic feeding trays for both photo and standard-sized paper. The built-in scanner functions from the color flatbed on the top of the printer and has a maximum scanning resolution of 2400 dpi, matching high-end multifunction units. It can also scan in 48-bit color and at a maximum resolution of 9600 by 9600 dpi, far better than most systems. While in many respects the Artisan 710 and the Artisan 810 are extremely similar printers , the 810 also includes a built-in fax machine with a 33.6 kbps modem, able to transmit at a rate of 3 seconds per page in both black and white and in color. It has enough RAM to store up to 180 pages and a maximum of 60 speed dials. The relatively low input capacity of the main paper tray makes this printer likely unsuitable for primary use for anyone seeking to print large quantities of documents or large volume documents. However, this is clearly a printer designed for photo applications, for personal use, and for personal networking use. The Bluetooth photo printing adapter is the only available add-on. If you purchase this printer, don't expect to be able to do anything more than it does at the time of purchase, as it is consumer-grade equipment and it is not expandable. The printer will not transmit scanned documents via wireless networking connections, requiring a direct connection between the printer and the computer or for you to scan to a memory card, then to connect that to the computer. 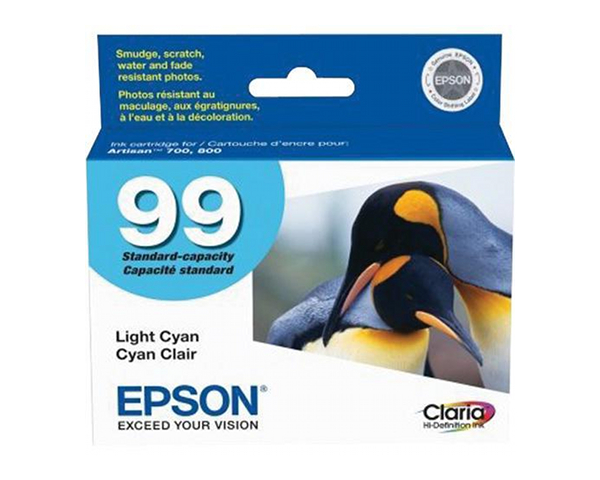 The Artisan 810 includes nonremovable ink pads that, when exhausted, will cease to function, causing the printer to shut down until returned to Epson for replacement. 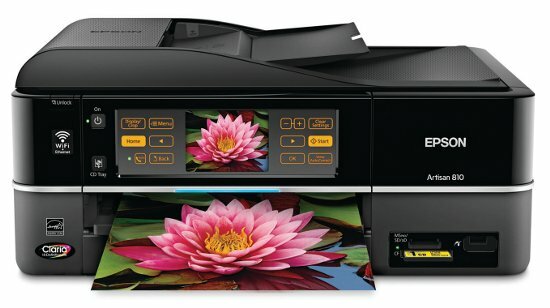 Review it: "Epson Artisan 810 "
Unlike earlier inkjet printers that only required replacement of a black and of a color cartridge, the Artisan 710 requires six cartridges to produce its high-definition images. Furthermore, the 710 goes through a charging process whenever a new cartridge is installed, draining some of all the installed cartridges in the process. 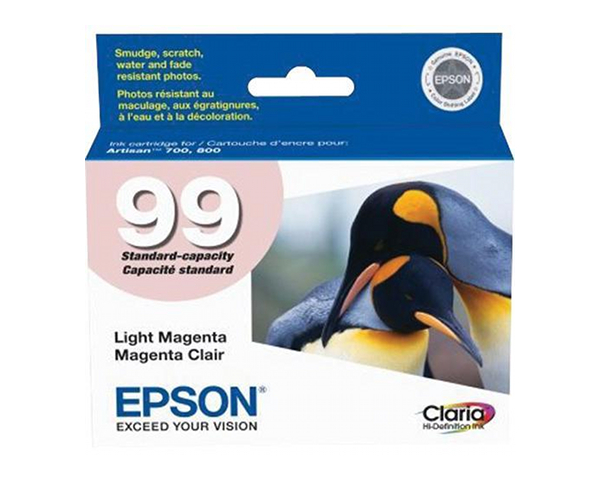 Both standard and high capacity variants for the color cartridges are available: the standard color cartridges yield approximately 500 pages each and the high capacity cartridges are rated at approximately 855 pages each. Black cartridges are only available in high capacity and rated at approximately 545 pages each.